There’s growing momentum around the idea of fostering “consent culture” in our dance scene. But what does that mean? And how can we teach that? I have good news for you: it can start with two very easy lessons that will also help your dancers think about communication and creativity. What is Consent? Why Does it Matter? In our dance scenes, there’s a lot of places where we assume consent. If they allow themselves to be dragged onto the floor, if they don’t push you away, if they say “thank you” and smile after the dance, we often assume everything went well. When we have a culture that assumes rather than asks, or that passively accepts to avoid conflict or embarrassment, we can never be sure of how our partner feels. We may make someone uncomfortable or even injure them without ever having malicious intent. We may also find ourselves feeling trapped and unable to get out of an undesirable dance situation because of social pressure. Consent is actively saying “yes” to something. When it comes to dancing, that’s saying “yes” when you’re asked to dance. It’s closing the 10% into close embrace by wrapping your arm around your partner. Sometimes it’s not clear whether someone is nonverbally saying “yes” or “no.” Rather than assuming a lack of refusal means a “yes,” practicing consent means that we either ask more clearly or assume that our partner would prefer something else. 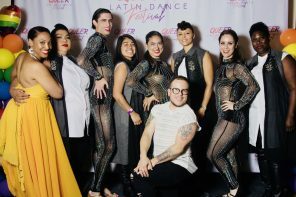 I want consent to be part of our dance culture because that allows me to be certain that my partner wants to dance with me and is enthusiastically part of what we are creating together. I want to feel confident asking for a change or saying “no” to something that makes me feel uncomfortable. I love it when someone asks me and actually listens for my answer. 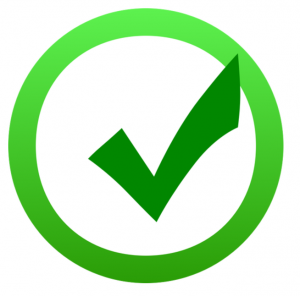 Whether verbal or nonverbal, an enthusiastic “yes” is the best kind of yes! How Can We Teach Consent? I’m going to take you through two lesson plans that can work for anyone from beginners on up to experienced dancers that want to practice breaking some of these old patterns. The first lesson focuses on changing holds or positions. This is such a fundamental part of partner dancing, but it often gets left out of any kind of conversation. It’s most often just left up to the leaders in Latin dances to decide what hold(s) the dance will have. 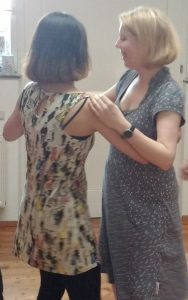 People assume that dancing kizomba or tango means that we will connect in close embrace. This lesson will challenge those defaults. Start by introducing the idea of consent. Invite people to share some stories about times when actions without consent have made them uncomfortable or created problems. Ask about times when people have been unsure whether what they were doing or experiencing was okay. Then talk about how much confidence and joy you could find, knowing your partner is enthusiastically engaging in the dance with you. Now it’s time for some practical exercises! Divide the class into leaders and followers. If your community is one that has many people who change roles, then go through each exercises with people in one role, then allow people to choose roles again before repeating. Depending on the level of the class, you might want to start by showing how these holds should look and feel in your dance. Start with leaders in open position. Demonstrate how they can move into closed position by moving closer to the follower and then wrapping their right arm around the back. Emphasize that these are sequential rather than simultaneous. For followers, show how they can affirm consent for closed position by lifting the left arm when the leader moves closer, making it easy for the leader to get the embrace, and then putting their left arm into position. Then demonstrate how they can instead maintain the open position distance by backing away as the leader moves forward. Practice time! Leaders essentially ask for closed position nonverbally, and followers practice actively assenting or refusing. Change partners several times. Then it’s time to reverse the tasks. Show how followers can ask for closed position by moving closer to the leader with the left arm moving up towards the leader’s arm or shoulder. Then demonstrate how leaders can assent by wrapping the right arm around or instead moving back as the follower approaches. The next round take us to close embrace, where your chest is in contact with your partner’s. Close embrace can feel very intimate and isn’t comfortable for everyone with every partner. However, I also really like using the 90-10 rule, an adaptation of how the title character in the movie “Hitch” explains the right way to kiss a woman: to paraphrase, you close 90% of the distance, and hold until she (maybe) goes the final 10%. Demonstrate this technique. Talk about how to pay attention to whether your partner tenses up and/or leans away or rather relaxes and closes the distance. Then have dancers of each role try being the initiator. I like to start this exercise with followers asking for close embrace first. The followers move to within a few millimeters of the leader’s chest and adjust their left arms (but loosely, not pulling the leader closer). Then it’s up to the leader to consent by wrapping the right arm around appropriately, or to create distance again (whether by holding the frame and resisting the advance, or by going into another move). After a few practice rounds with different partners, let the leaders try the 90-10 approach, with followers choosing to close the gap or use their frames to maintain distance. Of course, having once agreed to move into closed position or close embrace shouldn’t mean being stuck there. Most leaders know how to move into another hold, but you can show beginners how to use their frame to create distance. A simple underarm turn that resets the open position is also a nice transition. The technique for followers is simple: increase the tension in their backs and start to move away. For more experienced followers, you might consider showing them how to ask for an underarm turn or otherwise moving into something different. Both sides require listening for the cues that indicate your partner would like something different. This is a good opportunity for a mix-and-match exercise. After practicing each role asking to move away, invite everyone to try any combination of the three previous exercises, moving through different holds and positions. Whatever you call it, there’s usually a moment in our partner dancing when we break physical contact. In a lot of dances, that moment is dictated either by an instrumental break in the music or by the leader sending the follower out into it. The first time this happened to me was in salsa dancing and I hated it. For at least two months I dreaded the moment when the leader would let go and I would have to figure out something, anything to do, while my leader did some shines. Now, obviously I had to learn eventually, but there’s no rule that says every salsa dance must include shines. So what if we considered this another opportunity to practice consent? Have the leaders initiate breakaway. Followers can accept and go into some sweet solo moves, or they can keep doing the basic step with the left arm still up, making meaningful eye contact with the leader. Leaders can then choose whether their creative idea must immediately be expressed, or if they might be just as happy to take the follower into hold once again. Followers should also have the opportunity to ask for some solo space. There are so many points in the dance where this can happen, but I like to demonstrate at least one bad idea, like jumping back and away. and at least two good ideas, like letting go mid-turn and dancing away or initiating a rotation over the follower’s right shoulder that allows you to roll off the leader’s right arm. Then of course it’s up to the leader to agree and go into a shine or perhaps insist a bit on the frame – or even release into breakaway but stick to a basic step while asking for reconnection with a welcoming palm and intentional eye contact. You can ask your dancers to practice this with one role going into breakaway at a time, but then also have a mix-and-match exercise. I like to build mine up: first, either partner can ask for breakaway and consent or refuse, then the other partner asks for the next hold change. Talk to everyone about what this lesson meant for them. What new ideas do they have about two-way communication in their dance? How will they try to listen to their partner on the dance floor? Come back to some of the stories from the beginning of class. What strategies could they use to address such situations? These exercises can also give rise to creative ideas and the opportunity for them to be expressed. Empowering followers to be initiators means there’s twice as many chances for something new to enter your dance. When one partner asks for a change in hold, the other will need to respond and adjust. If you are about to do something awesome in the current position, then the possibility is there to see it through, rather than being cut off by the need to make the position change – as long as your partner is listening and willing. 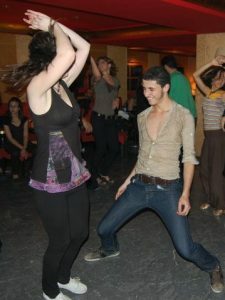 If the dance seems to be stagnating as it currently stands, you can suggest a new connection or breakaway and offer space for something different to occur. What about the second lesson? You can now find it here. In the meantime, share your stories around consent! You can also check out more resources related to dancing and consent here. You do have a lot of valid points in there but I disagree with your premise. Teaching “leaders” to look for signs and telepathically read the “follower”‘s mind is absurd and puts all of the burden onto the leader’s shoulders. Dancing takes two people to happen and as such those two people need to take “responsibility” for their own experiences. Followers need to be taught that it’s okay to say no. Followers need to stop a dance if they don’t enjoy it or prevent it from happening altogether if the leader is someone the follower doesn’t like dancing with. Saying we need a clear, verbal consent is basically saying we need to treat followers as children who don’t have their own agency to voice their desires. That sends out the wrong message. I do agree though that the leader should look out for any signs to be considerate but not as a requirement in order to have “consent”. Simple fact is that everyone who comes to a dance event and is in the dance floor is someone who wants to dance. We can’t ask everyone to not assume everyone who comes to a dance event is not dancing. That’s, again, absurd. There will be people who tag along with friends and sit out. Clear key is anyone who is standing in the dance floor. I think leaders should exhibit politeness by asking the follower for a dance rather than dragging her by the hand. A smile doesn’t hurt either. In addition, I think the follower should have full control of whether they want to dance with a certain leader or just not at all and to say NO if they don’t want to dance; otherwise, it’s an assumed YES given the context. I don’t want leaders to have the ‘burden’ of all communication – I want it to be a two-way street. Yes, followers should voice their opinions, but there should be an appropriate opportunity for them to do so once the dance begins. If you are at my house and I give you a glass of Pepsi, I’ve now created the expectation that you will drink it because you’re in my house and you’re my guest and that’s polite. But maybe you don’t like Pepsi or are diabetic or on a diet or whatever. You can still say, “Could I have some water instead?” but you might feel awkward about it. It’s already been poured. It might be easier just to pretend to sip it and let it be – not because you’re a child who can’t say what drink you prefer, but because of all the social expectations. In our dance, consent should definitely start with the invitation, but it shouldn’t end there. Continuing to ask, listen, and give space for change means that our partner doesn’t just do things because of some obligation created by having said “yes” to the dance. One of my the early problems was figuring out consent due to lack of skills. This was also one of the reasons I took up dance because I had a hard time reading body language cues and dancing gave me a chance to practice that and achieve collaborations. Early in my dance experiences I would just go around asking for dances until I realized that getting frequent rejections was a bad thing and stressful to follows. While the formulaic consent exchange suggested here is OK, what is required is a community observed standard for communicating positive interest. In my experience this opening is communicated informally by eye contact and possible smiles or may be indicated by a follow moving to the music by the dance floor. If you are walking around and someone is avoiding looking at you, that could be an indication they are not currently interested in a dance. Becoming more observant of people and carrying off this skill well is part of the opportunity I saw in learning to dance. If anyone says no, accept this positively, its not a good method to create additional tension by being disappointed. One fun idea is to know where the ladies room is. If a woman is walking in that direction they most likely have ideas other than dancing! If nobody wants to dance with you, put the time to good use by going around and seeing if any women who are new or sitting in the back rows would like a dance. Your positive spirit will be noticed. 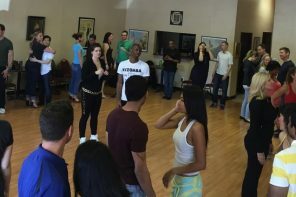 What do you think of the idea to teach general partner communication in beginner classes instead of lead and follow? I think especially the consent problems would be resolved by that immediately and maybe even some others as well. I have good experiences with that. Marius, I believe you proposed something similar on my article about the NYC Zouk Festival. I do assert that those elements should definitely be included as part of the curriculum of any partner dances. I think that partner dances that don’t rely on momentum could potentially be taught without set lead and follow roles (like some salsa or blues dances). However, I think that in order for beginners to learn to dance within the aesthetic of momentum-based dances (like WCS, lindy hop, most styles of Brazilian Zouk, all linear salsa, etc) and to handle that momentum safely, we need to start with the scaffolding of defined roles. So, lead + follow + listening and adapting. That said, you can certainly run classes in which all participants get an opportunity to work on both roles. Additionally, as people gain greater mastery in either or both roles, they can get better at listening and suggesting outside those roles (beyond the minimum bounds of consent). For which dance(s) have you seen this instructional style practiced? Hello Rachel, thanks for your reply! Use of momentum requires some refined conscious control of your own body. If you don’t have that yet, then you can’t use momentum. Safety first, your own and that of the others. The solution though is simple, as to any given music, there is no requirement at all for using momentum in your dancing. There are plenty of other things you can dance to help developing your body awareness more and more. And of course, as long as you are not familiar with the music in question, then momentum is even more none of a priority. Marius, I can only think that we must have very different dance experience or different definitions of momentum. Beginner lindy hoppers can’t have both partners deciding when a swing out should happen – getting it right when one partner decides is hard enough. 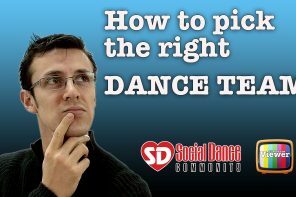 Beginner zouk dancers would have trouble if either partner could decide to direct the momentum in a new direction at any point. Any momentum-based dance I can think of needs the dancers to first learn the basic “physics” of the dance before they can “break the rules” and safely play outside those base movements. I would love to see a video of any students you know with up to 3 months’ experience who are successfully using momentum in a partnered dance without any lead or follow role education. I’m open to a paradigm shift. In the mean time, yes, I do indeed think that for playing with momentum in the couple you do not need a specific role education, because the technical aspects of communication as well as the skills required for momentum handling are exactly the same for both roles. It’s like a normal conversation – there are no different roles for both participants talking to each other. Assuming any roles is an optional play that can be agreed upon and also interesting to do, but it’s not necessary if you just want to enjoy a nice talk with your partner – which of course can be arbitrarily complex, depending on either one’s knowledge of the subject and detail of communication skills. Hi Marius, I see we agree about a lot. I also teach this kind of conversational dancing for example in blues dancing. But I do think if you look at videos of lindy hop or Brazilian zouk you’ll see the kind of momentum that I mean. I’ve been thinking about an analogy to walking in a park vs driving a motorcycle. When we are walking in the park (say bachata or lots of blues dancing), it’s not really important who decides at any given moment how quickly we go or in which direction or if we stop. That’s doable and enjoyable without any defined roles. In a momentum-based dance, the momentum is like a motorcycle. It’s possible that the driver is in charge of deciding everything- where to go, how fast, when to stop for a break, etc. (like in old-school ballroom dancing). But we need both partners to have good balance and angle themselves around turns etc. to have a smooth ride. And the passenger has to hold on for them to stay together. My preference is when one person drives but the passenger is also able to offer suggestions of where to go or how. And the driver should always listen when the passenger asks for a change or a stop. But we need one person controlling the accelerator and steering – we can’t both drive at the same time, or we will lose control of the vehicle. Maybe we get experienced enough that just a bit of tensing up or slumping is a cue to change the speed or take a break, or just a tap of the shoulder tells the driver to make a turn. And since this hypothetical motorcycle doesn’t belong only to one person, it’s always possible for anyone to decide to be the driver when we get on. Anyway, that’s how it makes sense to me. Leading and following are roles that can become more fluid as you advance, but handling momentum requires some scaffolding up to that point. I am definitely open to learning a new way that allows us to have that fun with momentum without anyone ever learning to lead or follow, but I haven’t seen or experienced it yet. I like your motorcycle analogy, as I am a biker myself 🙂 You say “we need both partners to have good balance and angle themselves around turns etc. to have a smooth ride” – yes! What we do not need is that the passenger clings on the rider like some attached backpack. There would be no skill and no communication in that. So what we need is each participant to know how to behave on a motorcycle at any time – the skills and understanding we acquire only by riding our own bike. The passenger then knows how to behave in the next curve that he/she sees coming, the right time and the right amount of their own job in keeping the whole motorcycle in a smooth ride. The couple only needs a very light connection to share with each other what they are doing, can easily negotiate about doing some more risky stuff or whether take the left or the right at the next crossing – it’s their both decision, not only of one of them. That there is only one wheel is not relevant to the decision and it is only due to the fact that the motorcycle is a one person design. There would be no problem at all to have two sets of all the steering controls for both participants to contribute to the agreed upon decision. And they have of course no problem at all switching the positions. And they can do a more sophisticated dance: The coordination of each of them riding their own motorcycle in a relationship towards each other. So in my thinking, the “rider” and “passenger” relationship is really two fully defined “riders” sitting at different places on one bike.